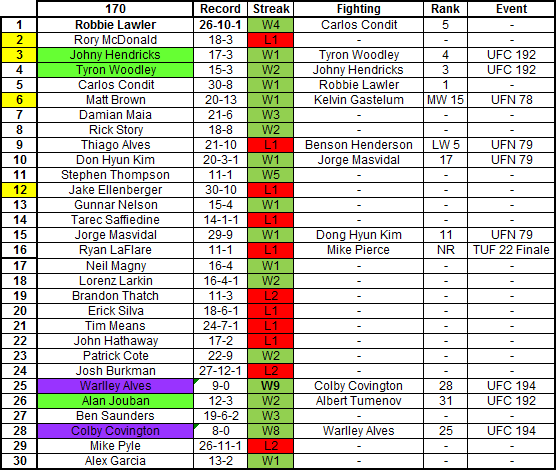 Seeing as how #6 Conor McGregor is fighting in a couple weeks, I thought it would be a good idea if my first Rankings Breakdown was in the Featherweight division. 1. 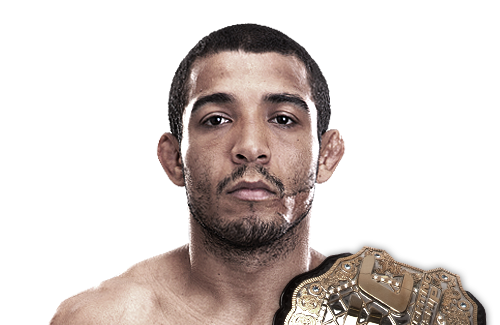 Jose Aldo (25-1) -Undefeated in over 9 years, Jose is one of the most dominant champions in MMA history. He is without a doubt one of the 2 best MMA fighters in the world along with Jon Jones. He already has 9 title defenses (2 in the WEC) and he’s only 28 years old. He has the potential to become the greatest of all time if he continues on the path he’s on. Jose’s last fight @UFC179 was an absolute war and my personal fight of the year against #2 Chad Mendes. This was Jose’s toughest test to date and he still proved to be the better fighter. His combination of lethal striking, unparalleled takedown defense, and Brazilian Jiu-Jitsu is second to none. Jose has already beat the next best 4 featherweights in his division, his next fight will likely be against #6 Conor McGregor (assuming he beats Siver) or a rematch with #3 Frankie Edgar (if McGregor loses). 2. 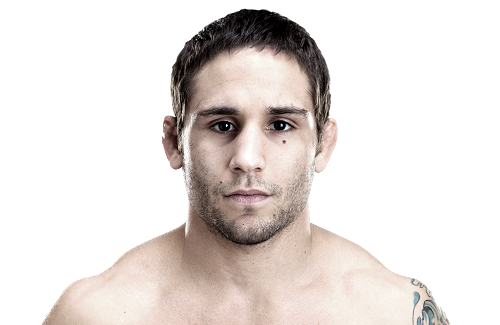 Chad Mendes (16-2) – The Clear Cut 2nd best 145er in the world. Chad would be a champion were it not for Jose Aldo. He has defeated every single opponent he’s faced with the exception of #1 Jose Aldo. Chad has fought for the belt twice and has twice come up short against the champion. He’s still only 29 years old and will probably fight for the belt again in the near future if he keeps dominating. His last fight against #1 Jose Aldo @UFC179 was the fight of the year. Both fighters knocked each other down in a 5 round war that proved that Chad Mendes was on Jose’s level, although he wasn’t quite better than him. There was no shame in the loss, he proved to be the first man to truly test Aldo. 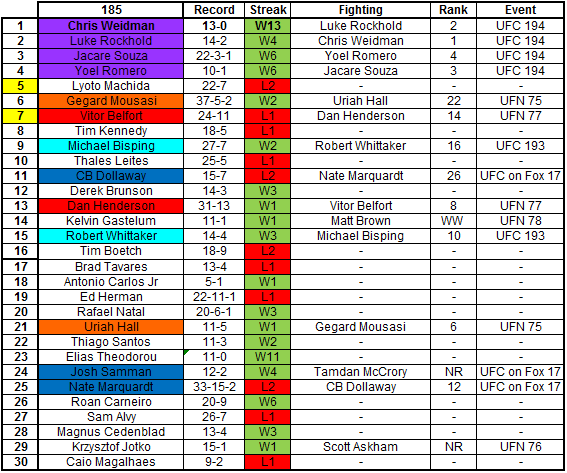 Chad is the top contender but there are still plenty of fights out there for him against top 10 FW’s. He’s already had 2 title shots so I’d expect for him to get a few more wins under his belt to get another shot at Aldo. Personaly I’d like to him fight #3 Frankie Edgar, #4 Ricardo Lamas or #8 Dennis Bermudez. All 3 fights present interesting stylistic match ups for him and would help in creating another #1 contender. 3. 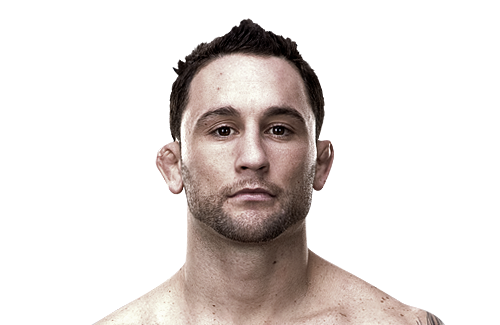 Frankie Edgar (17-4-1) – The former Lightweight Champion has had some success since dropping down to the Featherweight division. His only loss was his first fight against the Champion Jose Aldo which he lost via decision. Frankie is one of the best fighters in UFC history with wins over greats like BJ Penn, Sean Sherk and Gray Maynard. His last fight @UFN57 was an absolutely dominant performance against #5 Cub Swanson. Frankie absolutely dominated the fight for 5 rounds with suffocating top control and tremendous ground and pound. He choked out Swanson with only 4 seconds left in the fight. Frankie has won 3 straight fights since losing his title fight against Jose Aldo. He might be receiving the next title shot if #6 Conor McGregor loses his next fight, but most likely he’ll have to get another win or 2 before his rematch with the Champion. I think fights with #2 Chad Mendes or #4 Ricardo Lamas both make sense since all 3 men are fighting back towards rematches with #1 Aldo. 4. 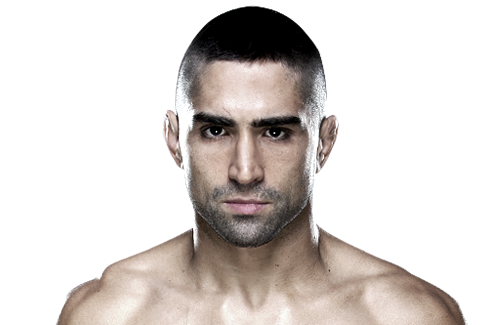 Ricardo Lamas (15-3) – Ricardo Lamas is without a doubt a top 5 FW in the UFC. Since joining the organization he’s gone 6-1 with 4 finishes. His only loss in the UFC is to the Champion #1 Jose Aldo. Lamas isn’t great at one specific thing except that he does have a great killer instinct. The 32 year old is working his way back to another title shot and is riding a 2 fight winning streak. His last fight @UFC180 was a surprisingly quick finish against #8 Dennis Bermudez in Mexico City. Lamas was able to Choke Bermudez out in 3 minutes and showed a difference in skill level between the two fighters. The win helped solidify Lamas as a top 5 contender. Ricardo has won 2 fights since losing his title fight against Jose Aldo. He’s been calling out #5 Conor McGregor but it’s unlikely he’ll get the fight any time soon. He’s more likely to face #2 Chad Mendes or #3 Frankie Edgar next depending on how the UFC wants to determine the next contender after McGregor. 5. 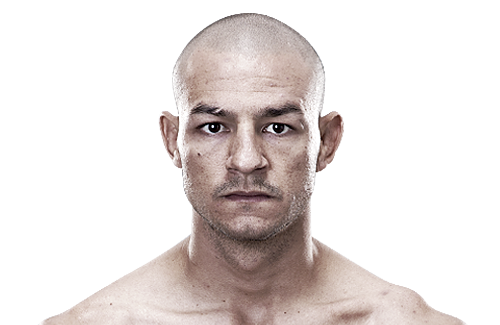 Cub Swanson (21-6) – Cub Swanson is in a tough spot in his career right now. He is unquestionably a top 5 featherweight, Swanson was riding a 6 fight winning streak before losing to Edgar. During his winning streak he picked up wins over fellow contenders: #7 Dustin Poirier, #9 Charles Oliveira, #11 Dennis Siver, & #12 Jeremy Stephens. Cub Swanson is a very good fighter with legit KO power. The problem is that Cub has now lost the 4 men ranked above him in the division, and he’s been finished by 3 of them. Cub is 31 years old so its going to take a lot for him to make his way back to a title shot. His last fight at @UFN57 was a devastating defeat at the hands of #3 Frankie Edgar. Cub was 1 win away from a shot at the 145lbs belt but it all went away after losing to Edgar. Cub was somewhat exposed as he was thoroughly out wrestled by Edgar before being finished in the last seconds of the fight. I’m not sure if Cub will ever have the skills to be a true #1 contender. His latest loss really put a halt on Cub’s title aspirations so he is going to need a number of impressive wins against fellow top contenders in order to position himself back in line for a title shot. 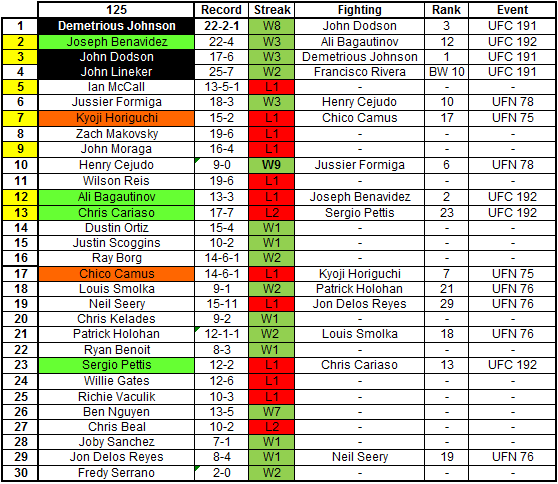 Fights against #2 Chad Mendes, #8 Dennis Bermudez or #14 Clay Guida all make sense to me. 6. 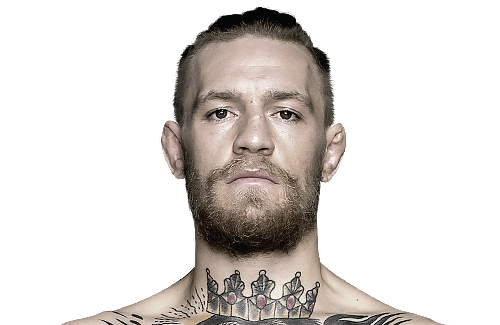 Conor McGregor (16-2) – Conor is the UFC new superstar. He has the support of an entire country supporting him and he is riding an impressive 4 fight winning streak inside the UFC. Conor is second to none when it comes to his charisma and the ability to promote himself. He has a gift for talking, and simply put when he talks people want to know what he’s saying. This combined with his unique fighting style make for a very exciting fighter to watch. His last fight @UFC 178 was a quick TKO victory over rival #7 Dustin Poirier. Both fighters talked their fair share of trash before the fight, but it was McGregor who was able to walk the walk and back it all up. He showed that he was a class above Porier and he moved one step closer towards his fight against the champion #1 Jose Aldo. Up next for Conor is a fight against #11 Dennis Sivar @UFN59 on January 18th. (For my preview of the event go here). 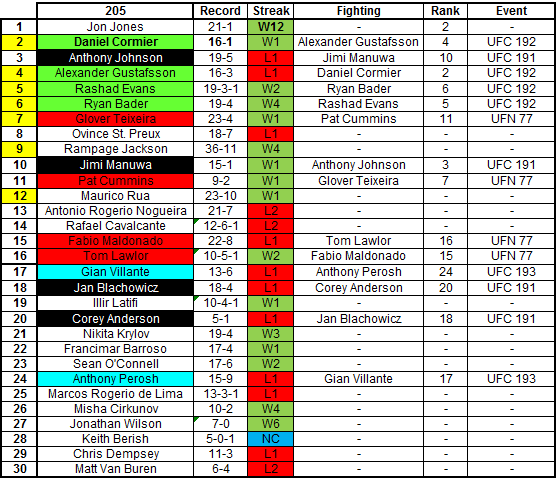 Siver is the only thing standing between Conor and a shot at Jose Aldo’s belt. Conor is the heavy favorite and is already predicting a finish in under 2 minutes. 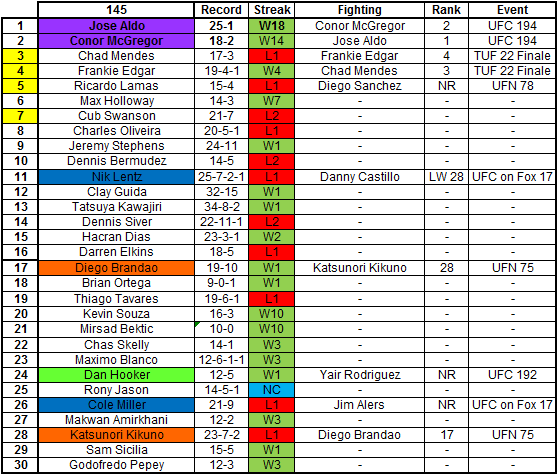 If McGregor wins the he’s likely to be facing #1 Jose Aldo for the belt in Dublin, Ireland sometime in 2015. 7. 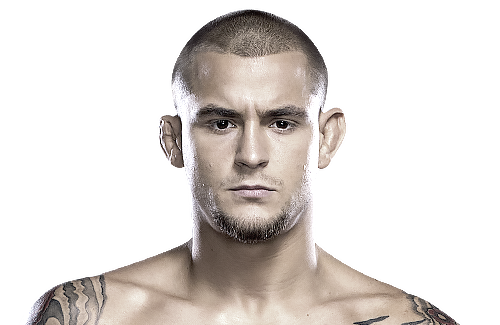 Dustin Poirier (16-4) – Like Cub Swanson Dustin is in a tough spot right now. With losses to #5 Cub Swanson & #6 Conor McGregor his future as a top contender in the division looks bleak. Dustin is an immensely talented fighter and he’s only 25 years old, but I’m afraid that he might have already reached his peak. He is a great offensive fighter but he has too many defensive liabilities to be able to stay at the top of the division. His last fight @UFC 178 was a painfully short TKO loss to superstar #6 Conor McGregor. There was a lot of talking and build up before the fight and Poirier ended up looking pretty bad not even making it 2 whole minutes in the cage against McGregor. This loss further solidifies the idea that although immensely talented Porier will likely never contend in the top 5 of the division. Up next for Porier is a move up to the UFC’s 155lbs division. I’m not sure it’s the right career move for him considering how many immensely talented fighters populate that division, but if he feels like he needs a fresh start in a new division then who am I to blame him? 8. 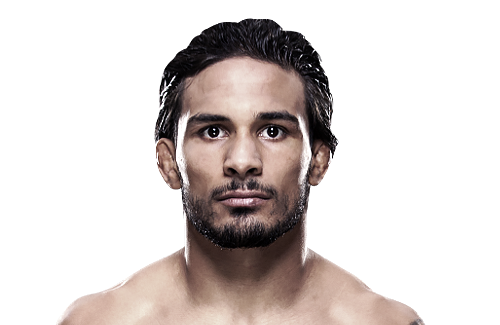 Dennis Bermudez (15-4) – Bermudez is one the most athletically gifted fighters in the 145lbs division. He is one of the few young prospects looking to become a top contender in the featherweight division. He has powerful wrestling and ever improving stand up. However his loss to #4 Ricardo Lamas really did pump the breaks on the idea of him contending for the belt any time soon. Bermudez last fought @UFC180 in Mexico City against #4 Ricardo Lamas. He lost the fight via submission in the 1st round. Many people thought this fight would be a coming out party for him as a top 5 featherweight but instead he proved to not quite be on that level yet. He’s still only 28 years old so the loss shouldn’t be too big a setback for him in a division that’s always looking for fresh new challengers. Dennis was riding a 7 fight winning streak before losing to Lamas so it’s not like all of that just goes away with 1 loss. He is still a top 10 FW and should fight a fellow top contender like #5 Cub Swanson or #9 Charles Oliveira in order to start building his way back up to a title shot. 9. Charles Oliveira (19-4) – “Do Bronx” has been in the UFC for quite some time now and it looks like he’s finally started to put it all together for a run at the top of the division. He is 25 years old, he has great Muay Thai and in my opinion the best submission game in the entire division if not the entire UFC. He’s been able to submit men that were previously thought to be impossible to submit. 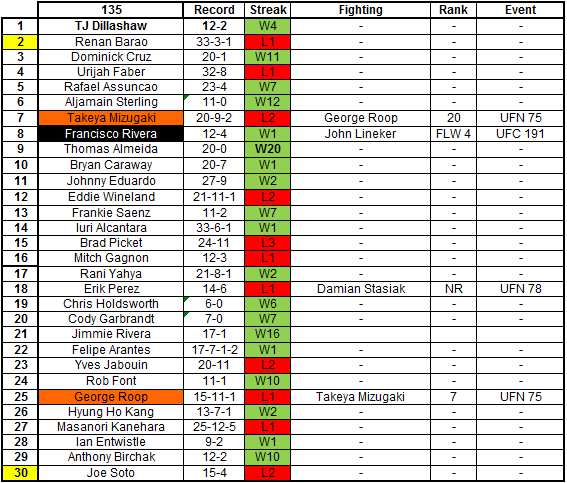 Oliveira is currently riding a 3 fight winning streak with wins over #19 Hatsu Hioki and #12 Jeremy Stephens. His last fight was @The Ultimate Fighter 20 Finale against #12 Jeremy Stephens. Oliveira controlled where the fight took place with his grappling and was able to pick up the unanimous decision defeating the always dangerous Stephens. “Do Bronx” is 5-2 since dropping down to the featherweight division with his only losses coming to #3 Frankie Edgar and #4 Cub Swanson. He’s showed incredibly promise but he has had trouble making weight coming in above the 146lbs limit in 2 separate occasions. Oliveira has just started to crack the top 10 of the division so fights against fellow contenders like #8 Dennis Bermudez or #11 Dennis Siver make sense for him. 10. Nik Lentz (27-6-2) – Nik “The Carny” Lenz is a grinding wrestler who is not really great at anything but always seems to find a way to win. 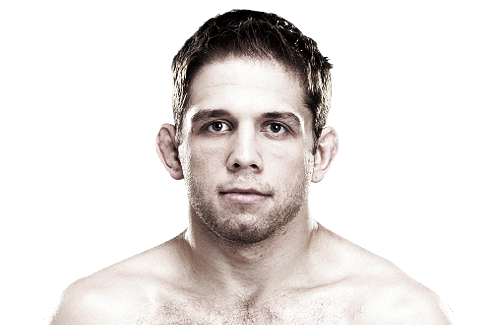 He is 4-1 since moving down to the featherweight division with his only loss coming to #2 Chad Mendes. He doesn’t have the most fan friendly style so I don’t see him contending for the belt ever, but that still doesn’t mean that he isn’t a top 10 talent. His last fight @UFN40 was an unanimous decision victory over former number 1 contender Manvel Gamburyan. Throughout his entire UFC career Lentz has shown that he is better than most but not quite good enough to ever make some noise at the top of the division. Up next for Lentz is a fight against the always tough #15 Thiago Tavares @UFN60. Lentz is currently on only a 1 fight winning streak so its important for him to win this fight if he wants to build momentum and start fighting bigger names. 11. Dennis Siver (22-9-1) – The German Kickboxer has had mixed success at featherweight since dropping down from lightweight. He’s fighting #6 Conor McGregor on January 18th, its a big fight for him, he should be a big underdog. 12. Jeremy Stephens (23-11) – The former LW just lost to #9 Charles Oliveira, Stephens has great KO power, but he may have hit his ceiling just outside the top 10 at FW. 13. Max Hollloway (11-3) – One of my favorite fighters. Holloway is an action fighter with slick boxing and great body shots. He is only 23 years old and he already has 10 fights in the UFC. He’s riding a 4 fight finishing streak, and his only losses are to #6 Conor McGregor, #7 Dustin Poirier 7 #8 Dennis Bermuez. He’s expected to fight #21 Cole Miller @UFN60 on February 15th. 14. Clay Guida (31-12) – The Carpenter has seen better days in the UFC. He was absolutely dominated by #8 Dennis Bermudez in his last fight. 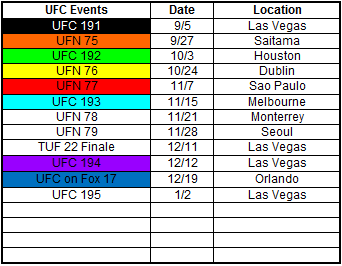 He has no fights scheduled since then. 15. Thiago Tavares (23-5-1) – An interesting new addition to the UFC’s featherweight divison. The former lightweight has found sucess at 145 with 2 straight submission wins at featherweight. 16. 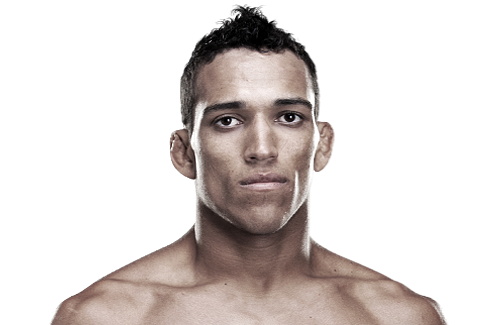 Hacran Dias (22-3-1) – The Brazilian fighter has been in the UFC since 2012 but he’s only fought 4 times. Consistency has been an issue for him, but his last win over #17 Darren Elkins proved that he has the skills to contend at the top of the division. 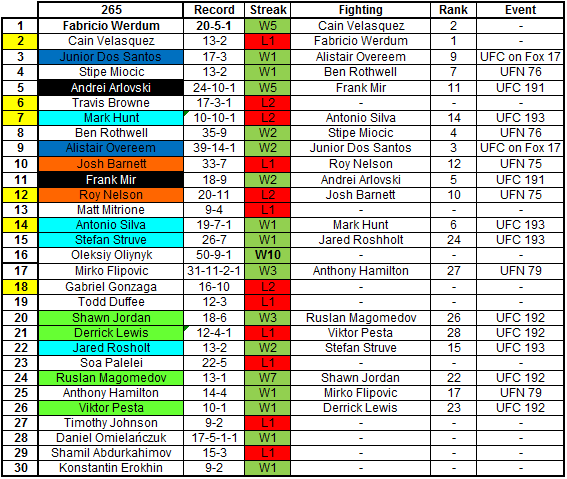 The following are my rankings of the top 16 fighters in each of the UFC’s 10 weight classes. I will update these rankings monthly or after every major event. 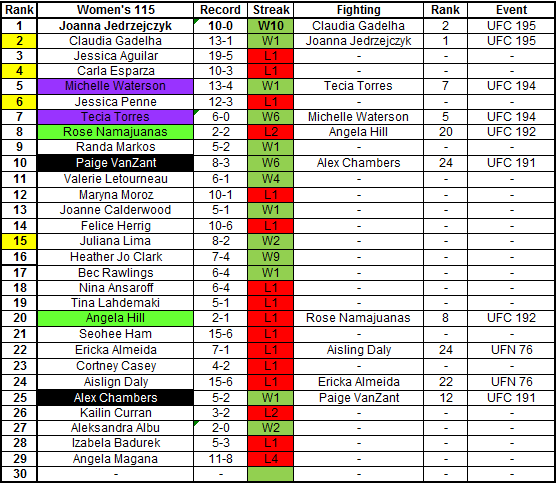 These are the rankings I use when referring to a fighter’s ranking anywhere in this website. 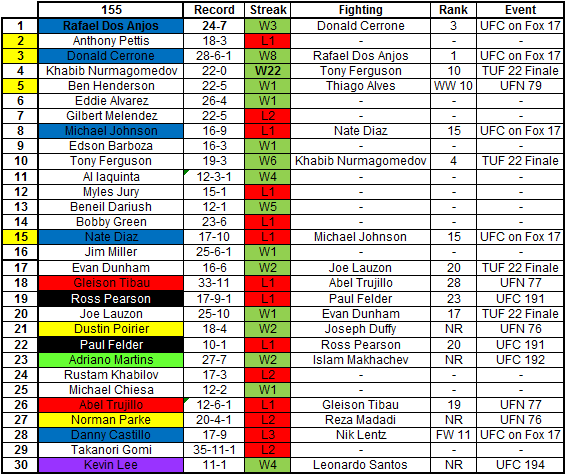 I determine these rankings using a fighters win loss record, how impressive his wins are and how bad his losses were. This ranking system is subjective as this is not an exact science. 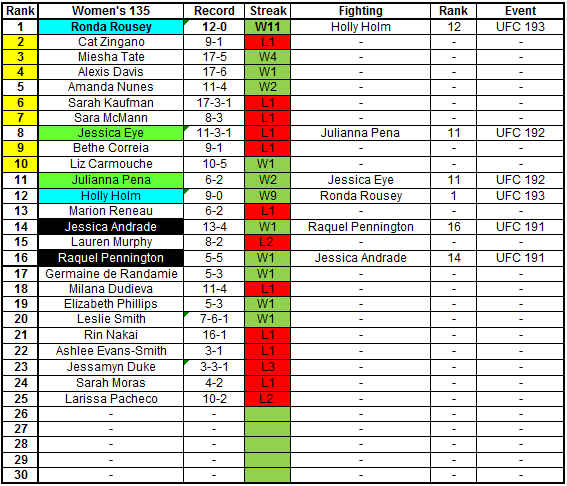 I will be going into more depth in my rankings when I start posting my Ranking Breakdowns for each division. Let me know what you think of the rankings!